Discription : Described by Parents' Choice as "a dream-time album filled with story songs about times long ago, mischievous and gentle little animals and magical worlds of faerie", Celtic for Kids is a delightful collection of traditional music from Ireland, Scotland, Wales, and the Isle of Man. 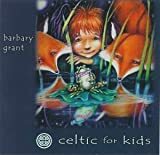 Recorded by Irish harper and singer Barbary Grant, this Celtic playground also features fiddle, flute, uilleann pipes (played by Eric Rigler of Braveheart and Titanic fame), cello, and pennywhistle. Celtic for Kids is full of imaginative surprises. The Milking Croons on Track 6 include a field recording of actual milking sounds (courtesy of Valentine the cow). Dance to Your Daddy on Track 15 features a 12-year-old step dancer and Barbary's own year-old twins giggle their way onto the Manx Washing Song on Track 3. Ten of the eighteen tracks are performed in their native languages including songs in Irish, Scots Gaelic, Manx, and Welsh. English lyrics and translations are provided in the liner notes. Ellipsis Arts will feature Track 6, the Manx Ushag Veg Ruy (Little Red Bird), on their upcoming Celtic Dreams CD. A Parents' Choice Award-winner for 2002, this albums' lively yet gentle spirit will appeal to children of all ages and to the young at heart. I love Celtic music in general, and it is exceptionally beautiful collection of songs. I especially like the fact that many of the songs sung in their native language, and common in some of the pace of the song. voice Barbary 'and harp quite charming, and interesting to listen to many songs and sing, especially Ushag Weg Rooi, Leprechaun, and Donal Hunchback. Whenever I listen to this recordng, I can't help but smile and tap my toes. There is a very nice variety of instrumentation and, of course, Barbary's singing is beautiful and evocative.